This weekend, Atlantic Discovery was treated to two days of training from the legendary Leven Brown, Leven Brown Adventure and Ocean Services. On paper Leven is one of the most experienced and respected ocean rowers in the world, with 30,000 sea miles notched on his sporran, and an exceptional and unparalleled knowledge of all things rowing. But, if you think this bedrock of expertise gives an inkling of Leven's calibre, I can vouch that nothing compares to being in his presence. He treats every person with respect, and as an absolute equal. This is a man whose moral compass points true north at all times - no calibration required. Even more remarkably, Leven's every word and action is quietly understated and unassuming, yet inexplicably his leadership is accepted by all, without question. Jack cuts the cake while singing "happy 150 days to us". Testament to his character, Leven drove all the way from Scotland to Weymouth overnight, and met the team for breakfast at 8am sharp. 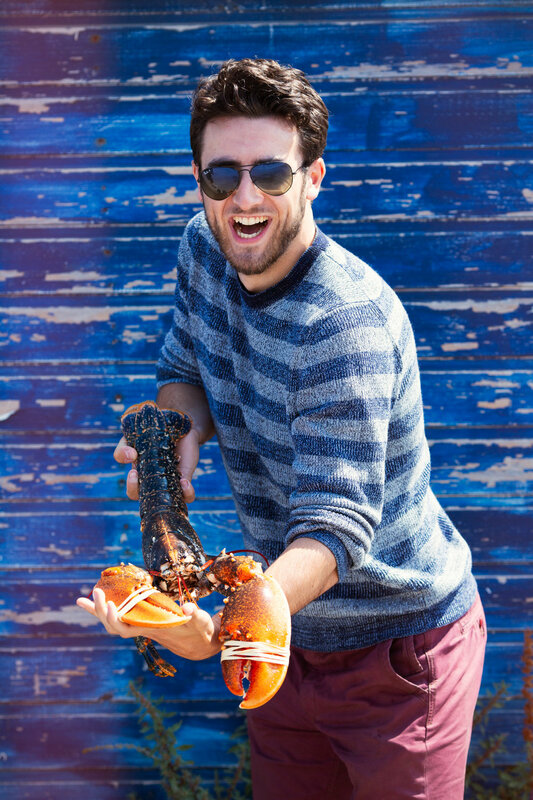 Isaac getting to grips with a lively lobster. The arrival of cake at lunchtime to celebrate 150 days (eek!) had us all reflecting on how little time there is until the team launches in La Gomera. Suitably fed and watered, a cheeky visit to the local fisheries to get some fresh lobster and crab, then back to work in the afternoon to investigate Ellida's electrics. The end of the day was spent on Chesil beach, where I did a quick product shoot to thank our sponsors, and then had a swim with Isaac and Cam, witnessing one of the most beautiful and peaceful of nature's events from the clear still seawater. Leven told us that there would be around three still days like this one on the crossing - oh dear - not much calm weather to look forward to! I really enjoyed this weekend. I feel I'm getting to know the boys better and I'm so grateful to be working on this amazing project with them. Sunday saw us launching Ellida, then rowing out of Weymouth harbour to test and practice using the autohelm. Then lunch, a debrief and home. Chatting to Ben as we packed up, he told me that he would trust Leven with his life. "What really resonated with me was that our journey will be a compromise between where we are headed and the weather conditions. Leven has advised us not to fight the wind, but rather to work with it, and let the passage flow. I think this will be mentally challenging when we're doing the row, but I trust Leven with my life - even though I've known him for only 48 hours." Someone asked me recently if I was worried about my brother and the team going on this phenomenal journey. My answer was instant. No, not at all. I want Atlantic Discovery to do this challenge. The benefits of this life-changing experience far outweigh the risks - and I have a lot of respect for the race organisers - Atlantic Campaigns: they have a rigorous training and safety ethic. But the main reason for my confidence, is that Leven will be on board (albeit via Satellite). His happy place is on the sea, in a rowing boat. I know he will motivate the team on bad days, rejoice with them on good days, and he will guarantee they use the prevailing weather to their advantage on the crossing. Observing Leven, I get the feeling that he listens and watches and learns, gleaning information which he will use to choreograph the Atlantic Discovery row, knowing the boat, tapping into the personalities, equipment strengths, winds and currents, so the team's performance becomes a thing of beauty, flows to the tune of nature, and then comes to a final flourishing finish, having performed as well as it possibly could.